A new approach to handling your office’s printing & document supplies can start right now with you and our printer supplies team. Let us help your company’s printer supplies, security checks, forms supplies, and paper equipment, we’ll help you simplify your ordering, save you money, save you time, and help save the environment. Free quote for Partners for Purchasing & Maintenance Programs. We provide proven M.I.C.R. (Magnetic Ink Character Recognition) toner for both our U.S. and Canadian customers. Don’t be tempted by inferior quality M.I.C.R. toner when your checks and employees depend on it. We provide M.I.C.R. toner for most major brand printer models including HP, Lexmark, Dell, and many more. Not all laser printer toners are the same; the majorities of our laser printer toners are used in commercial applications and achieve very high performance levels. We provide toner cartridges that are a hybrid of exceptional reliability and affordability. Inkjet provides convenience, portability, small footprint at a reasonable price. We provide inkjet cartridges at a fraction of the OEM cost while providing reliability and quality our customers demand. Call us to take our Inkjet test and see for yourself how you’ll save and how our inkjet cartridges stack up. The security paper stock used for printing checks is an important element in the overall security program to protect the printing of checks. Our security checks have multiple security features that help prevent check fraud. Our stock blank security checks come in a variety of colors, medians, sizes, and check positions. If you have a unique design requirement, we can handle that too. We can help you with free art design work and mock up for custom checks. Our Non-Negotiable forms are a great way to print your direct deposit slips and other non-negotiable monitory documents. Non-Negotiable forms come in a variety of panel sizes with perforations and a pink face with blue backside for easy identification. We also provide blank cut sheet forms with perforations for different applications such as invoicing, mailers, and more. Tax Forms are available in just about every paper median for all your tax season preparation needs. 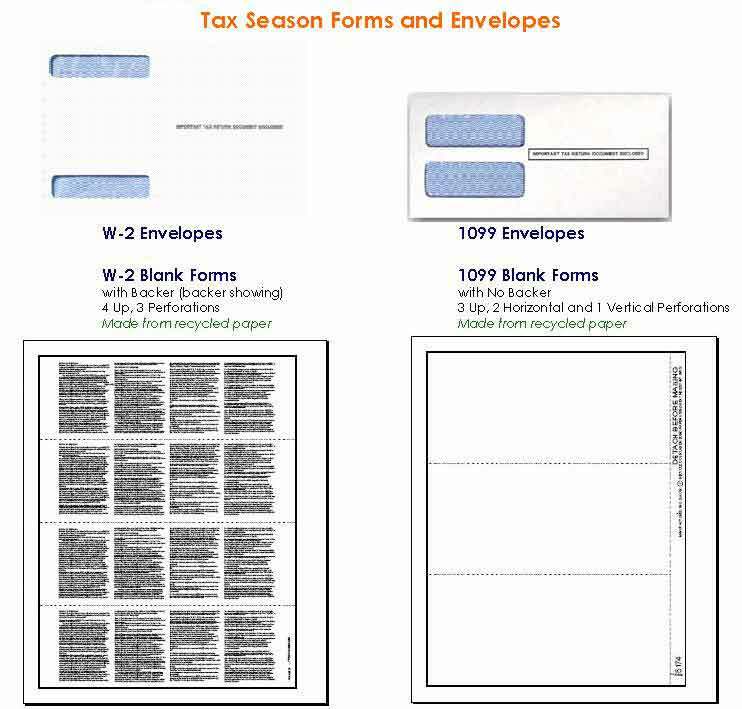 W-2, 1099, and many more are available as Blank laser forms, Pressure Seal forms, Continues forms, and Preprinted forms. 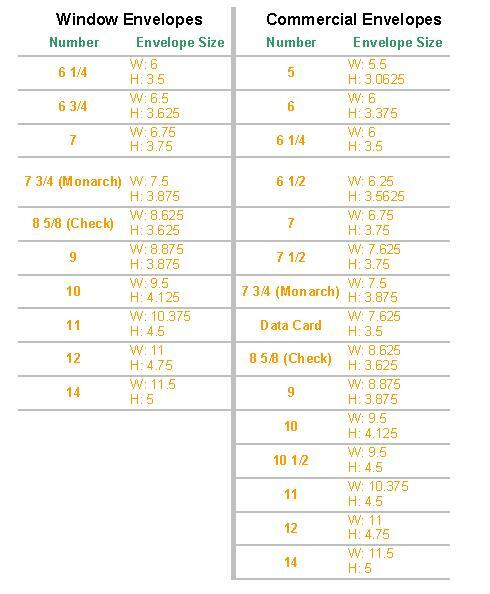 Security envelopes are available in four category sizes in either a double window or single window format. Return address imprinting on single window envelopes is available. Custom printed envelops and custom envelopes are also available. Post-Printed Material Handling: A few great tools to save money, time, labor hours, while increasing productivity. Our supplies experts are available to assist you. Qualifier: If your staff or you are spending more than 1 labor hour printing single page documents and then stuffing them into envelopes, then this may be a solution for you. Benefits: Reduce the number of paper products you use by 50%, speed up post printing production time, and reduce labor hours. Qualifier: If you need to print and mail multi page documents and find that it takes more than a one hour, then this may be a solution for you. How: The Folder-Stuffer device collects multiple pages from individual trays; fold the documents, and stuffs the envelopes in an automated efficient process. Benefits: Reduce labor hours, get more done within the same time, and expand the use to other projects and departments. The use of this device can be shared among multiple departments for maximum R.O.I. Qualifier: If you find the Folder-Stuffer devices of interest, then OMR may be an additional solution for your needs. How: Similar to the way Folders-Stuffers devices work, OMR or Optical Mark Recognition will automate the collection of specific printed items for separate recipients and then fold and stuff the documents into a folder. This is the same technology used by many banks, utilities, and other companies that need to provide printed statements to their customers. Benefits: Send out mailers to customers, employees, and vendors with containing individualized information. This application can be used by Accounting, Marketing, and other departments. Reduce cost, labor hours, and increase specific communications to a large number of people. Qualifier: Anyone interested in security. How: Industrial shredders work harder, longer, need to be reliable, and work continuously. These shredders come in many sizes: desk side models, office models, and industrial models. Some of the features include auto start/stop, cross-cut 1/16″ wide micro-cut, heavy duty waste bin, thermal overload protection, accepts paperclips, staples, CDs, and credit cards. And more. Benefits: Selecting the right type of shredder ultimately save money while providing added security. Commercial-grade shredders last longer and perform better than non-commercial-grade shredders. Selecting the right size shredder will also enhance the usefulness of your equipment. Qualifier: Anyone that needs to print. How: No two printers are alike. Based on your needs and expected type of use, we can help you select an appropriate printer for you needs. From low volume printers to high volume printers, monochromatic to color printers, new printers to reconditioned printers ÃƒÂ¢Ã¢â€šÂ¬Ã¢â‚¬Å“ Our staff will help you make the right choice for your needs. Benefits: You will receive unbiased brand advised when selecting your printer. We can M.I.C.R.ize laser printers for your check printing needs.